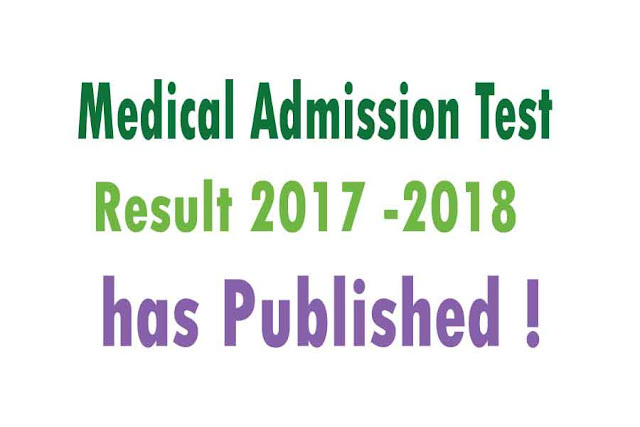 Medical MBBS Admission Test 2018 2019 result has published, See Medical MBBS Result here. MBBS Result 2017 has published!!! See your result on this official site http://result.dghs.gov.bd/ . You will also get SMS on your mobile phone. If your merit serial is on the top, then you will get SMS earlier, but if your serial is back or you have not got chance for admission, then you will get SMS later. GET PDF File of Selected Students in MBBS Admission Test 2017 - 2018 Result in this Link. Example of Result: First goto http://result.dghs.gov.bd/ and Enter Roll Number. The see your result. Medical MBBS exam 2017 Result is uploading on DGHS official result's website http://result.dghs.gov.bd/ . When uploading finished, it will be opened for all. Medical MBBS Admission Test 2017 - 2018 was held on Friday, 06 Oct, 2017. Today after 3 days of MBBS admission test 2017 2018 result has been published. How see MBBS Admission 2017 2018 Result? Generally, after 48 hours of examination, MBBS result publishes. Wait please until that time. In this year Highest Mark will be between 90.5 and lowest mark is minus 25. - said DGHS authority. Go to mobile message option and type and send to 16222. It needs 1000/- taka for challenge. You have to pay this money by Teletalk SIM. DGHS <space> RSC <space> Roll number and send it to 16222.
and sent it to 16222. DGHS <space> RSC <space> YES < space> PIN number and send it to 16222.